Ten years ago, while buying lipstick at the stand of a leading luxury cosmetics brand, I asked if I could bring back the empty packaging for reuse by the company. The surprised saleslady answered, “I am sorry Madam, we do not practice such things here”. 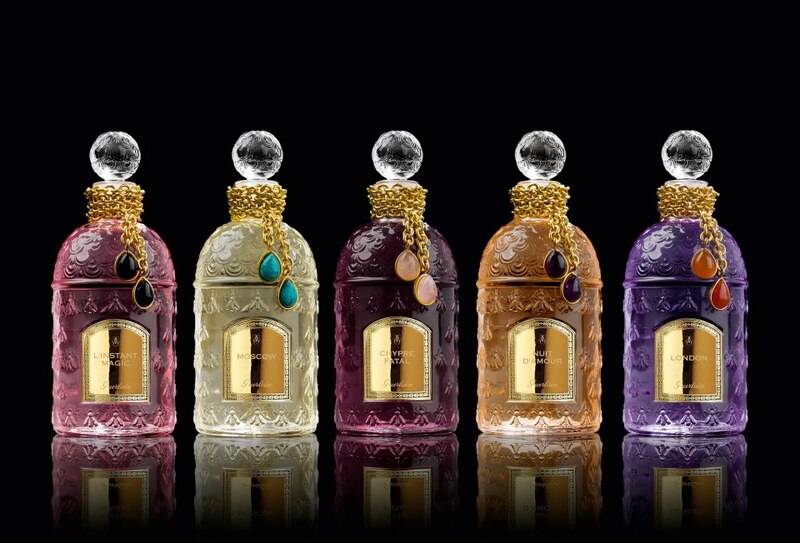 Today, premium brands like Guerlain, encourage their customers to return product packaging (empty perfume bottle, etc. ), which is then transferred to special centers for sorting, recycling and recovery. Before luxury brands began to be identified with large corporations – fashion houses that spend billions on marketing – they were associated with family values, cultural heritage, precise-craftsmanship and timelessness (jewelry and watches that are passed on from generation to generation). Today, we must add the ecological and social innovation necessary to ensure a sustainable future. Customers actively support this process by demanding more responsible behaviors from their favorite brands. The global emergence of social and environmental awareness represents the most important cultural transformation of the twenty-first century – to which the luxury sector must provide leadership if their brands are to retain their prestige – an essential element in the DNA of luxury brands. Luxury Industry revenues reached €210 billion in 2013 with French brands accounting for 25% of sales. The LVMH Group continues to lead the sector with revenues of €29 billion in 2013. Given this scale, the behavior of the industry has a major impact and through its leadership it can become a catalyst for driving aspirations of more eco-conscious lifestyles. In 2013, the LVMH Group (Louis Vuitton Moët Hennessy) invested €17.3 million in environmental protection – including waste management, water recycling, soil and noise pollution reduction, and projects to support biodiversity. Investments in efficient buildings, internal training and the sponsorship of environmental initiatives are budgeted separately. Supply chain monitoring, eco-design, energy efficient lighting, certification of business processes, ecosystems protection, materials recovery and sustainability audits are all integrated in the various brand strategies that are specific to each business sector: Wine & Spirits, Perfume & Cosmetics, Fashion & Leather Goods, Watches & Jewelry and Selective Retailing. Luxury brands are now building their core image around caring for society and the environment. Wanting to preserve their beauty and appeal, they must (as many already do) provide a persuasive narrative for their contribution to alleviate social and environmental concerns. Global warming, deforestation, resource scarcity, pollution of air, water and soil, endangered species and environmental degradation disturb the favorable conditions that have allowed the industry to develop and thrive. As LVMH Group CEO Bernard Arnault says, “LVMH owes a lot to nature”. And the business case for sustainability is made even more compelling because “green solutions” benefits extend beyond image building, they can also improve the bottom line through efficiency and cost reductions. 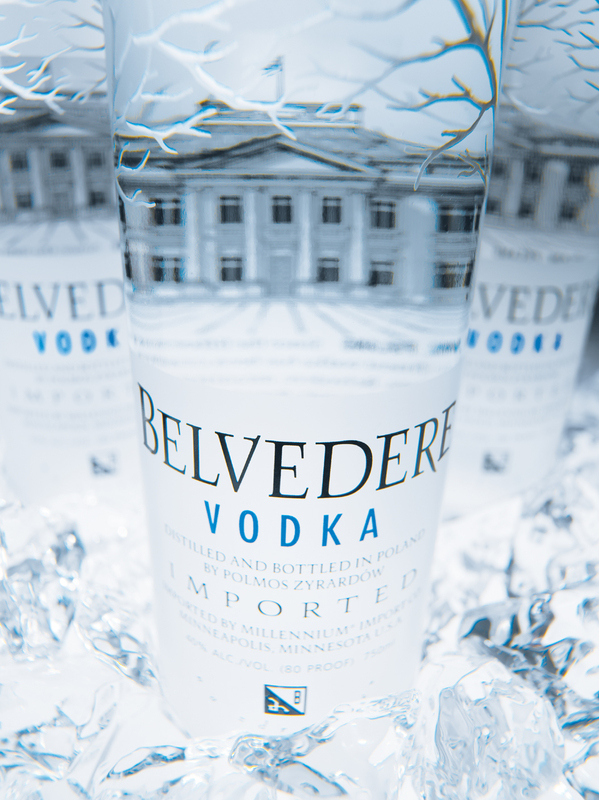 In the production of Belvedere vodka, a brand of Polish descent, distillery Polmos Zyrardów has converted its power generation from oil to natural gas and improved its energy efficiency through a heat recovery system. The energy generated is now used in the production re-heating process. With these solutions, carbon emissions were reduced by 36 percent or 2 thousand tons, the equivalent to the consumption of 850 thousand liters of gasoline, like removing 900 cars from Polish roads. In 2012, LVMH launched a program to optimize energy consumption using LEDs in its boutiques, using technology from Philips Lighting amongst others – reducing the Louis Vuitton Maison power consumption by 50% since 1995. In addition to lower power bills, the shops have better possibilities in terms of “play of light” to showcase products. Companies also benefit from recycling. LVMH created its CEDRE platform (Centre Environnemental de Déconditionnement et Recyclage Ecologique) to optimize the recovery and processing of waste generated in the production, distribution and recycling of its product packaging but also the waste from various events (exhibits, fashion shows, etc.). In 2013, it recovered around 1,600 tons of glass, paper, wood, metal and plastic. The Hennessy Maison has been modernizing its vehicle fleet – more then 20 percent of its cars are now green (electric and hybrids). Charging stations have been installed at the factories and employees received eco-driving lessons, which helped reduce fuel consumption, accidents and maintenance costs. At Sephora, a fleet of electric trucks serves distribution centers located in French city centers, reducing costs and urban pollution. The best strategy in terms of image and brand building in the luxury sector remains environmentally and socially responsible marketing. It is difficult to conceive a more compelling example for the imagination of wealthy eco-consumers then the fully biodegradable isothermal Veuve Clicquot champagne casing that is entirely made of potato starch and paper. Meanwhile, emotions-based cosmetics Maison Guerlain, engaged its brand in the protection of bees – the essential pollinators that are critical to healthy ecosystems. Through its Orchidarium research platform, Guerlain also supports the restoration of tropical forests – the natural habitat where orchids grow – passing along essential know-how to organizations that are involved in the collection of these flowers. Hennessy is also engaged in the protection of woodlands. The timber used for the production of cognac barrels comes from sustainably managed forests that are certified by FSC (Forest Stewardship Council) and PEFC (Programme for the Endorsement of Forest Certification). Promoting advances in science is also important for Belvedere. Since 2005, it has worked with Lodz University of Technology to develop research programs in biotechnology and to help attract the best graduates. Human rights stewardship is also important. Especially given the growing awareness of the social costs associated with precious metal and stone mining in the Third World. Responsible jewelry manufacturers became particularly vigilant in this area for fear of being associated with “blood diamonds”. 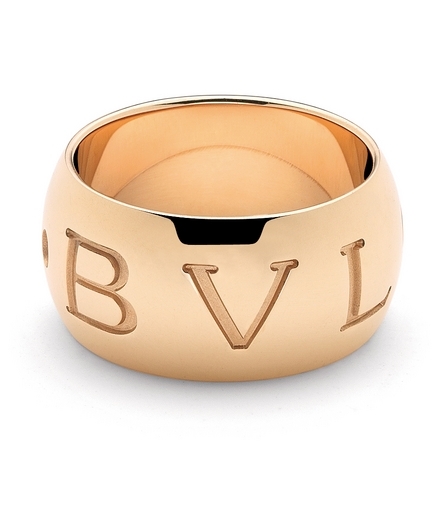 Since 2005, Bvlgari has obtained the Certified Responsible Jewelry Council (RJC) label, certifying the implementation of responsible ethical, social and environmental practices in its supply chain. Since 2012, Louis Vuitton is also RJC certified. Louis Vuitton also developed stringent environmental audits of its supply chain. There is also the implementation of ISO14001 with environmental assessment for transporters and warehouses. LVMH works to reduce environmental impacts by designing quality products that are long-lasting and easy to repair. The durability and longevity of luxury goods contrasts with the planned obsolescence that is incorporated in fast moving consumer products. Given the development of modern science, technology, and an awakening global consciousness, we realize that we can (and must) avoid repeating the mistakes of the past. Luxury brands enjoy global recognition and prestige, and we aspire to be associated with them. Aspirations are a critical element. If we want a better life and for meaningful leadership to come from the luxury sector, we better pay attention to what we buy and invest ourselves in asking the right questions. This is best path towards setting a new standard of sustainability for the industry and beyond. Is a Fireplace Ban Justified? While pollution alerts are sounding again in various French cities (Rennes, Nantes, Strasbourg, etc. ), Environment Minister, Ségolène Royal, cancelled a controversial full ban on all fireplaces (even the most modern ones) that was expected in Paris and 435 municipalities on January 1, 2015. Following discussions with forest and wood industry professionals, the minister felt that the analysis supporting the ban was flawed, that the law would be ineffective and that other measures should be explored. Studies showed that fireplaces generate 25% of the fine particle pollution in the region, at par with the transportation sector. These figures are disputed by the wood industry which claims that fireplaces cause only 5% of the fine particles while 40% come from transport. But while lobbies debate, pollution limits are breached in Paris, across France and elsewhere. 7.4 million French homes use wood as their main source of heating, up from 5.9 million in 1999. In Haute Savoie (French Alps), where the prevalence of wood burning is high, pollution is a serious problem. Similarly, in Canada, the city of Montreal estimates that its 85,000+ fireplaces generate close to 50% of the fine particle pollution in the city – far more then industry or transport. Faced with these problems, authorities in Montreal and France continue to warn about the dangers of pollution peaks, promote public transport, reduce speed limits, suggest to lower heating and ask not to use the …fireplace. Most people underestimate the impact of smoke pollution. But coming from a fireplace, a campfire or a wood-stove, smoke contains high levels of contaminants including small particles (that enter deep into lungs), carbon monoxide (CO), and other irritants with significant health consequences in neighborhoods where wood burning is popular but also indoors. Environment Canada warns about indoor pollution from fine particles that make their way throughout the house and remain long after the fire stops. The World Health Organization (WHO) considers that fireplace smoke causes cancer, headaches, eye irritation, respiratory disease and heart conditions. Particularly at risk are children, older people and anyone suffering from asthma and allergies. 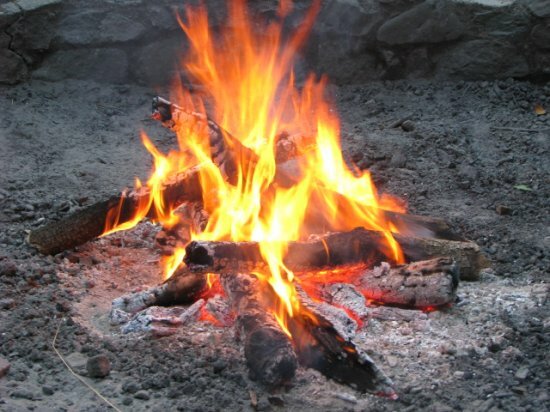 Studies have shown that even campfires cause pollution that can quickly exceed norms and be a multiple of those found in urban areas, even in zones with intensive industrial activity. In Montreal, fireplace pollution contributes to the premature deaths of 1,500 people. In Paris, studies suggest it reduces the average life expectancy by 6 months in the region. The WHO estimates that 3 billion people cook and heat their homes through open fires and simple stoves burning wood, animal dung, crop waste, and coal. More than 4 million die every year due to the indoor air pollution that can be 100 times higher then acceptable levels for small particles. More then 50% of the fatalities are children under 5 because of pneumonia caused by the high levels of soot inhaled at home. In poor countries people suffer from indoor smoke exposure because they lack better alternatives. It is odd that in the developed world, people who can afford better technology continue to use antiquated heating methods and expose themselves and others because of ignorance. Studies show that many people find the smell of burning wood pleasant and are not aware of its dangers. Surely, the authorities bear some responsibility for this. The heating performance and pollution levels are directly linked to the type of heating device, open fireplaces being the worst performing and the latest EPA certified pellet stoves are the best. According to experts, EPA certified fireplaces can reduce small particles pollution by 94% (versus old models that generate 70 grams per hour) through higher temperatures that improve combustion which dramatically reduces residual fumes and pollution. Agreeing with industry, Ségolène Royal confirms that technology can make major difference and should be deployed. She she prefers incentives to bans, like the €1,000 the Haute-Savoie region gives for the replacement of an open fireplace or wood-stove. People enjoy fireplaces – there is something primal and comforting about them – the sound of the wood crackling, the light dancing around the room. It is also comforting to know that if a storm or other event that takes out the lights and the central heating, we still have a way to cook, give some light, and can heat our homes. And wood, if managed properly, is a renewable resource. 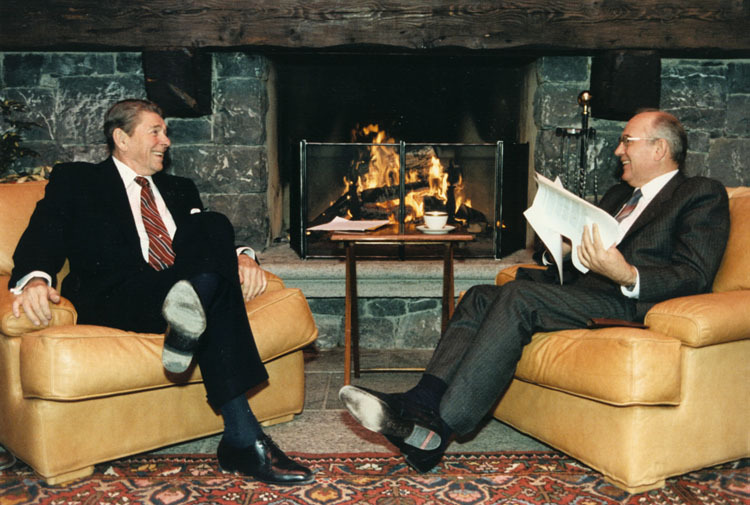 But the price to be paid for an open fireplace or for antiquated wood-stoves is too high. The best of both worlds is to use fireplace stoves, that use technology that helps eliminate particulates, improves heating performance while still providing the pleasure and security of the old fashioned fireplace. – New EPA certified stoves are 90%+ cleaner and much more efficient in terms of heating. – An open fireplace offers a very poor heating performance but generates massive indoor and outdoor pollution. It is costly, wasteful and should be phased out. – Never burn trash, plastic, paint, or wood that was painted/treated because this releases dioxins and other toxics. – Ideally use hardwood that is properly dry. Avoid wet and soft woods. Not only are they more polluting but they also provide significantly less heat. – Keep the installation clean and in good working condition. Regularly sweep the chimney. – To cities and authorities: awareness raising campaigns are needed. Financial incentives can play an important role but regulation, controls and sanctions will eventually be needed. Helping households better insulate their homes will also go a long way. 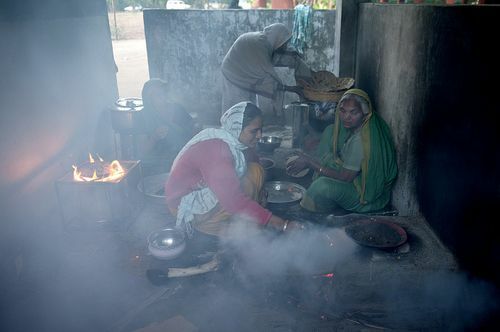 – Addressing indoor air pollution from ancient cooking and heating practices (in developing countries and elsewhere) is complex problem but solutions are available. The technology exists and can be affordable if proper financing mechanisms are implemented. Here is an example from The Gold Standard Foundation.